England celebrated like never before in 2004, winning an unprecedented eight consecutive Test matches. Andrew Flintoff starred with 603 runs and 24 wickets while Ashley Giles recorded 31 dismissals as New Zealand and West Indies were blanked at home. And England's tourists triumphed by seven wickets in their opening Test in South Africa for a new record. West Indies endured a miserable July and August, with captain Brian Lara's captaincy brought into question. The year began in the Caribbean, where Michael Vaughan's team recorded a 3-0 series triumph on tour as the pace bowlers came of age. Steve Harmison took 23 wickets, with a career-best 7-12 in Jamaica. All eyes were on what would have been the first ever series whitewash of the home side in the Caribbean. But Lara crashed England's party, reclaiming his world record for the highest Test score with a masterful unbeaten 400 in Antigua. As the English season stretched longer than ever before, West Indies found reason to celebrate again, snatching the ICC Champions Trophy at The Oval. Hosts England were their surprise opponents after beating Australia in the semi-final, Vaughan smashing 86. After a difficult summer, when England failed to reach the final of their own one-day series, it was a great recovery. Held in the UK for the first time, the tournament saw the USA play their first major internationals. On the county scene, Warwickshire's batsmen dominated the year to gain their first Championship since 1995, despite winning just five games. Glamorgan won the one-day Totesport League with two games left, their third such title in the last 11 summers. Gloucestershire were again celebrating C&G Trophy glory after their sixth final win at Lord's in as many years. And Leicestershire Foxes were the surprise winners of the second Twenty20 Cup after beating Surrey in the final. Away from home, there were 12 months filled with major Test clashes, most involving India. The year began with a hard-fought 1-1 series draw with Australia, whose captain Steve Waugh signed off with a battling 80 to save the final Test. Fourteen years after their last visit, India were allowed back to Pakistan, where they won their first Test series. A well-prepared Australia side ruined the end of their year though, with a comprehensive series victory in India. The year was not without controversy, with illegal bowling and the fate of Zimbabwe high on the agenda. As debate raged about his action, Sri Lanka's Muttiah Muralitharan broke the world record held by Courtney Walsh when he claimed his 520th Test victim. However Shane Warne, back from his 12-month drug ban and the first spinner to reach the 500 mark, passed him and was well clear by the end of 2004. Defections from the team saw Zimbabwe lose Test status but England were still forced to tour, and did so after a stand-off over media accreditation. The year began with shocking news when former Australia batsmen David Hookes died following an altercation outside a Melbourne hotel. 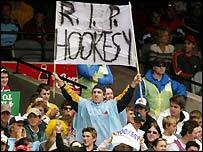 The Australian team were among 15,000 mourners at his funeral at the Adelaide Oval in January. The last post sounded in 2004 for Keith Miller, one of Donald Bradman's contemporaries, who died aged 84. And West Indies spinner Alf Valentine, who helped beat England in 1950, died a month after his 74th birthday.